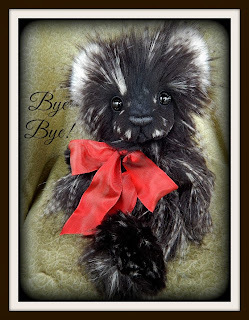 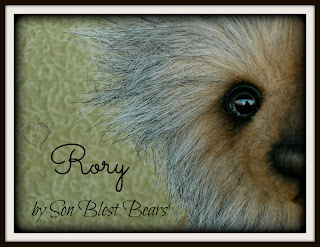 I am very tickled over how she turned out and I hope you will enjoy meeting her! 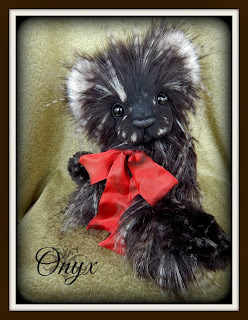 Onyx is currently available on ebay for 3 days. 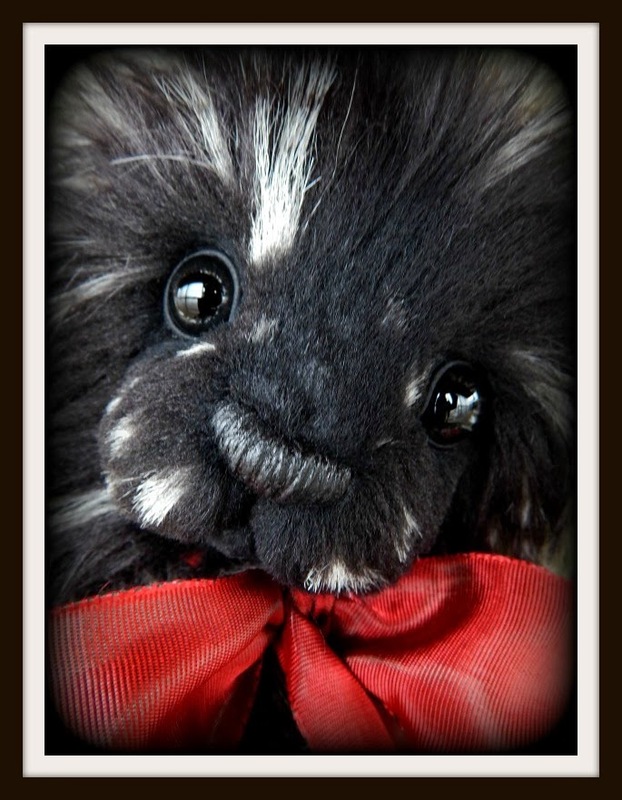 Please click on her auction link below to visit her! 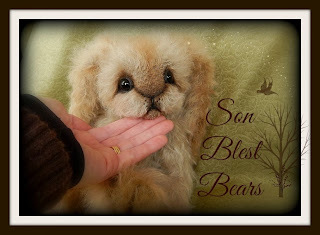 In her pictures she looks more beige than what she actually is, I had to take her pictures inside because it was below freezing and very windy outside! I tried but my fingers quickly became frozen and I had to come back in! Tillie has beautiful premium black glass eyes. 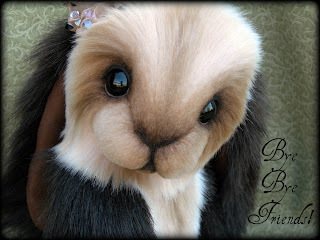 I have added cording around them to make them more bunny like in appearance and also added shading in browns and black. She has additional shading all over her, including her arms, legs, belly and ears in shades of brown and a tiny bit of pink. 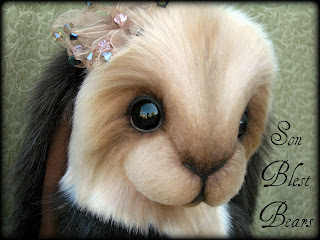 I needle/thread sculpted her face and added shading to enhance her pretty bunny features. 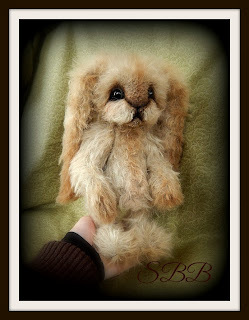 She has loooong floppy bunny ears which I have added a little bit of weight to with steel shot. 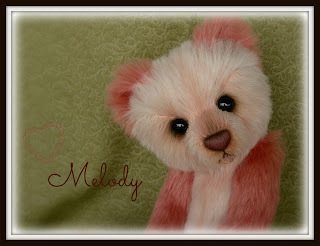 She is 5 way jointed with set screws, lock nuts and fiberboard discs. 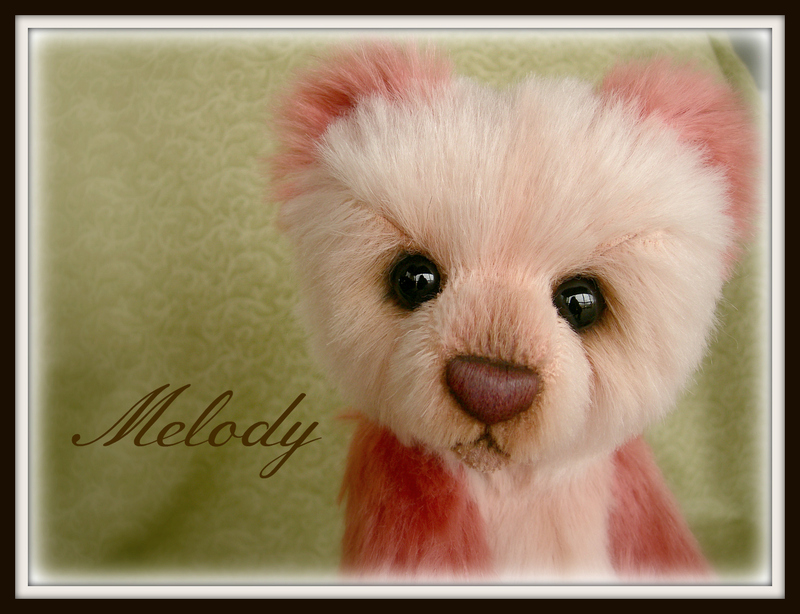 Her neck was jointed with a t-cotter pin and fiberboard disc. Her arms have wire armatures in them to allow for gentle posing. 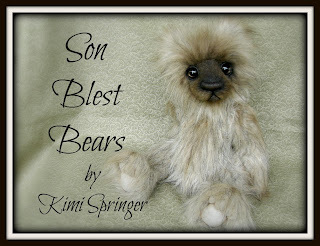 She was stuffed firmly with premium poly-fil and has steel shot in her belly. She is quite a heavy little bunny! 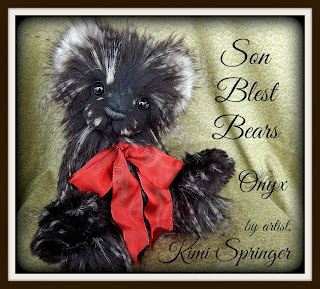 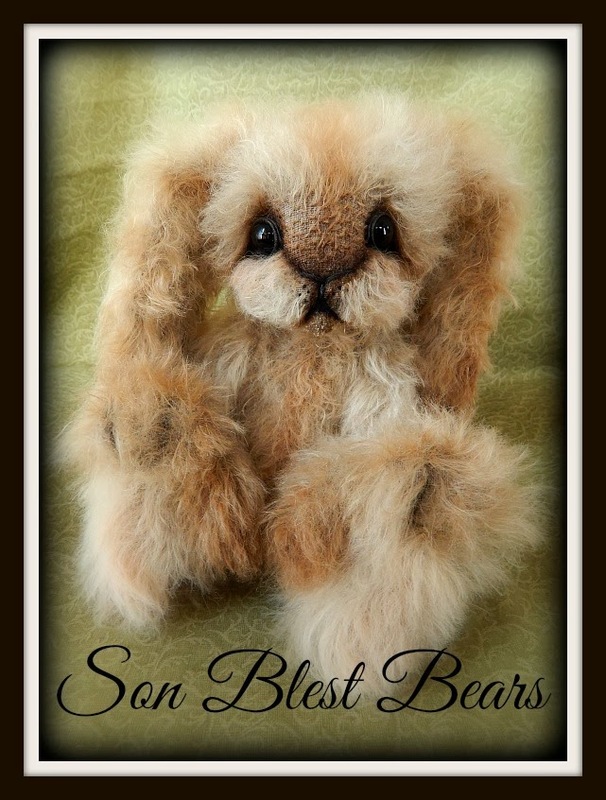 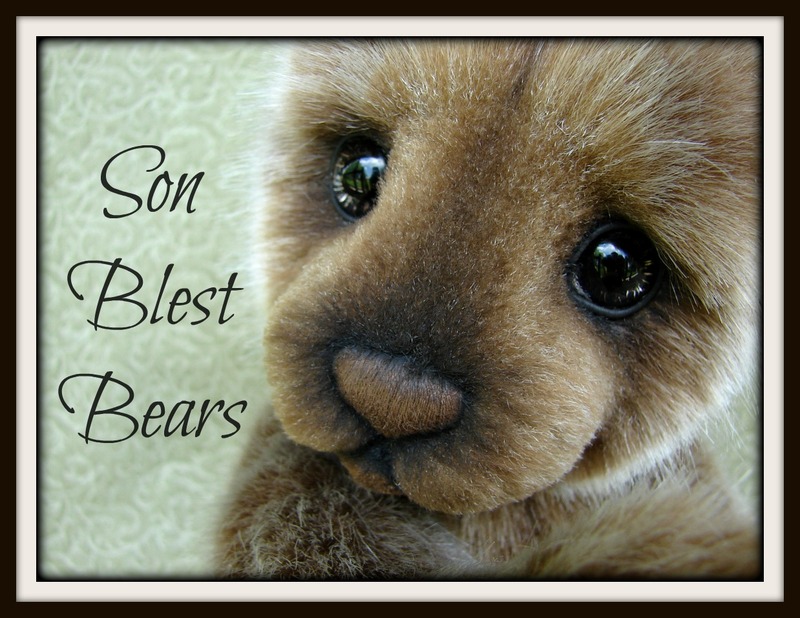 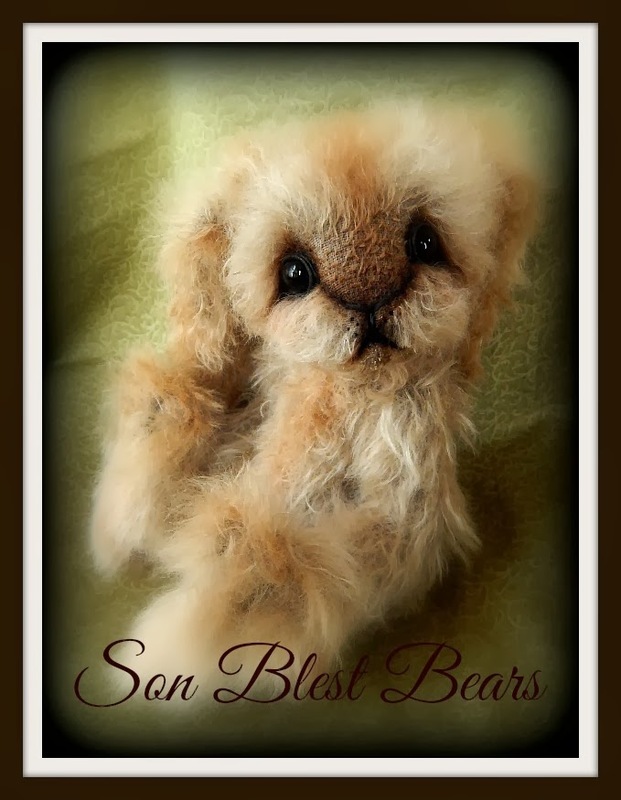 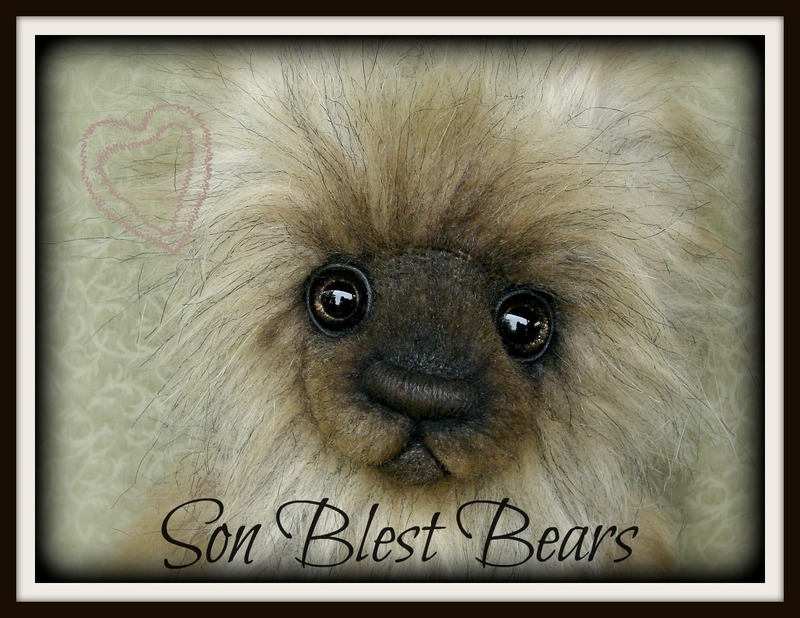 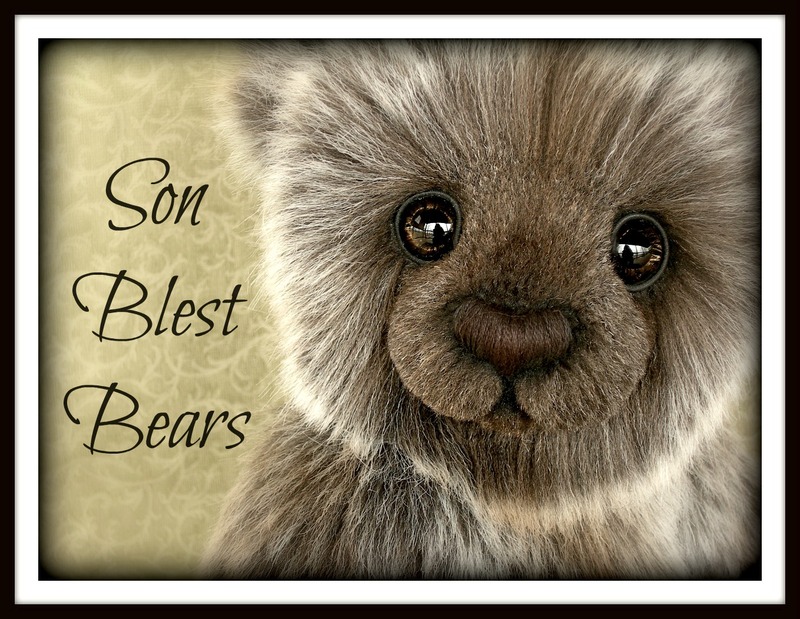 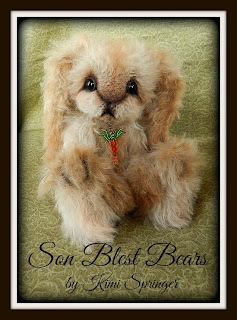 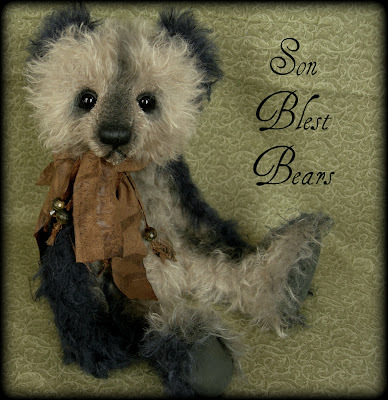 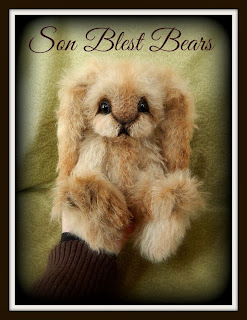 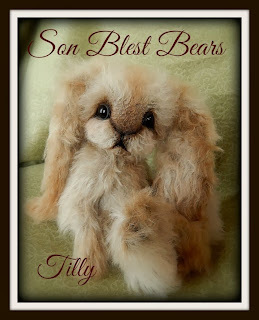 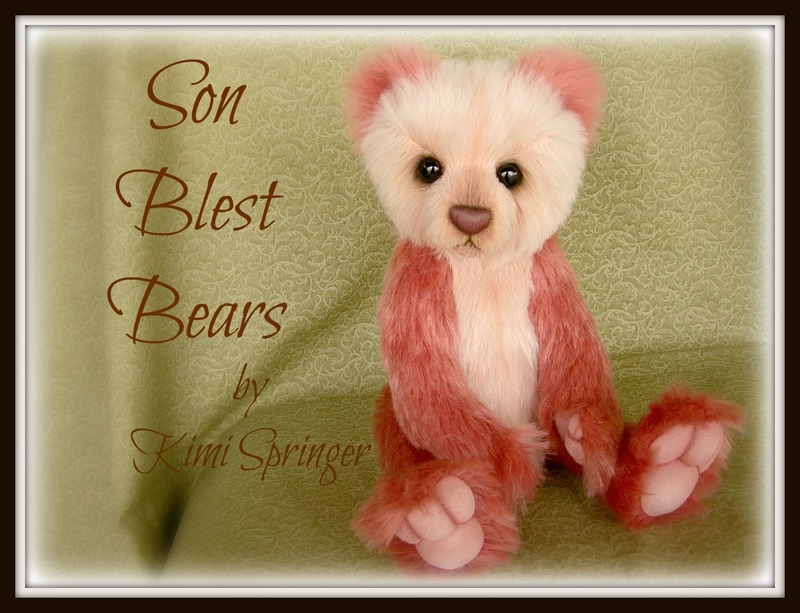 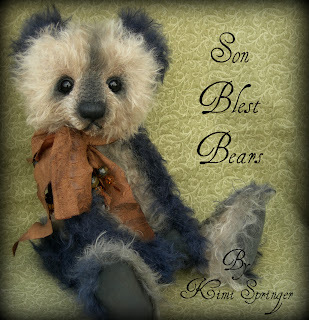 Tillie will come with a signed and dated birth certificate to show she is a one of a kind, Son Blest Bear (Bunny). She will also have a personalized hangtag with all her important information on the back (which is removable). Thank you so much for stopping by to meet Tillie! I would love to hear from you! 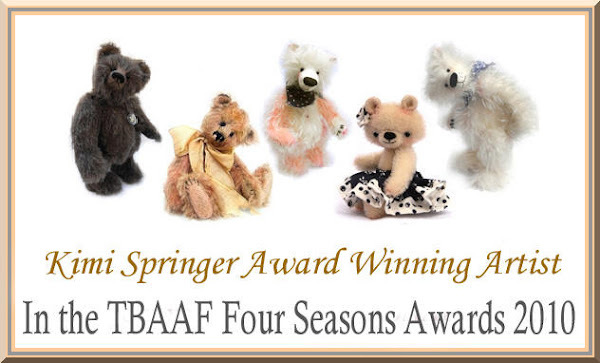 I would also be greatly honored to be added to your favorites! 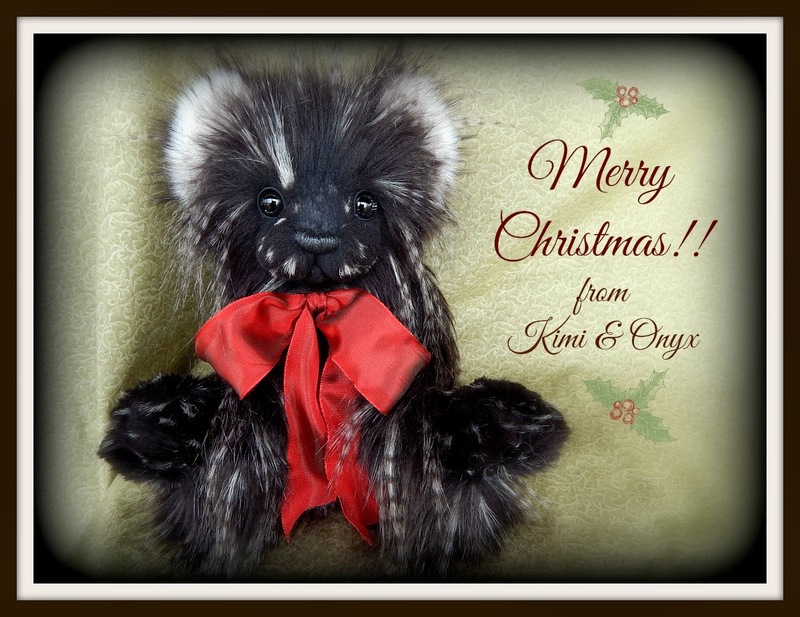 Thanks again and I hope you have a most wonderful day! 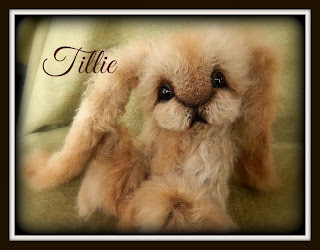 Tillie is currently AVAILABLE. Her adoption fee is $395 plus shipping. 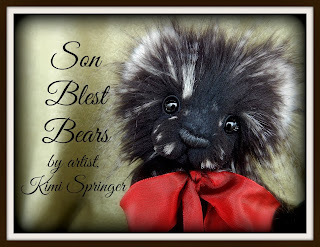 If you would like to purchase her please click on the link below to visit bearpile.com She is currently listed there :) Please feel free to contact me with any questions. 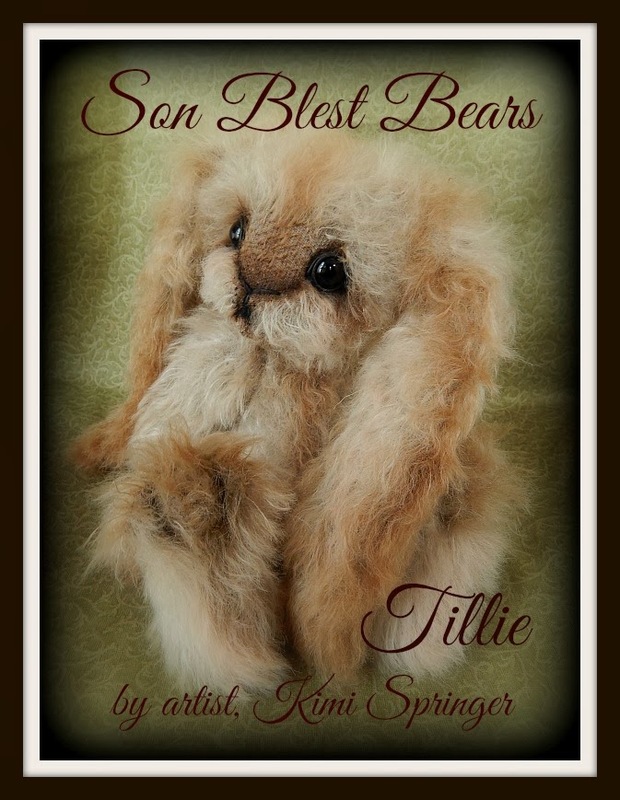 Shipping for Tillie will be $15 in the US. She would be shipped through USPS Priority Mail with insurance. 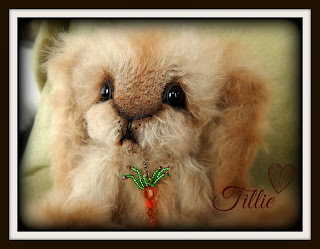 Shipping for Tillie for international customers would be $50 US dollars. She would be shipped through USPS Priority Mail International with insurance. Thank you SO very much again and I hope you have a most wonderful day and a beautiful Thanksgiving holiday week ahead! 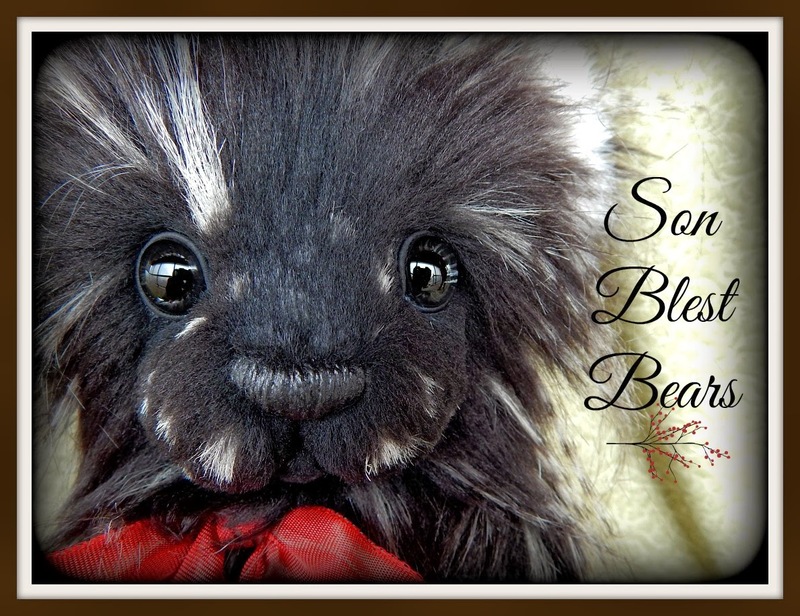 Chanook's Auction ~ Click here! Hi again :) I decided to make a blog just for my jewelry so I may leave this blog for my bears when they make their return :) I would love for you to stop by my jewelry blog, it's brand new so there's only one post so far, lol, but it's a start :) Just click the link below to visit! Thank You for all your continued support of both my bears and my jewelry too! Hi all :) I've been working on a lot of pendants and just got everything finally listed on ebay. 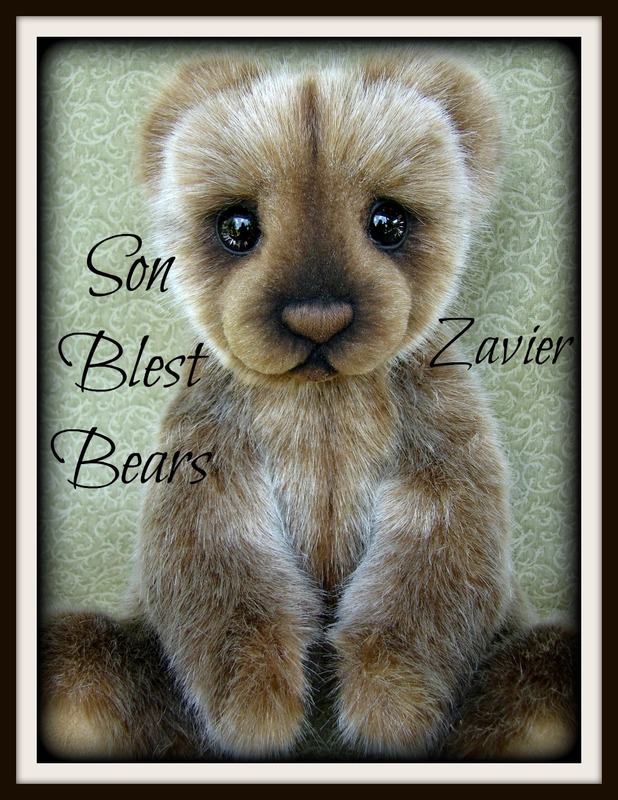 Please do stay tuned, as I will eventually have a bear ready for adoption but in the meantime I hope you will enjoy seeing my new beaded creations! 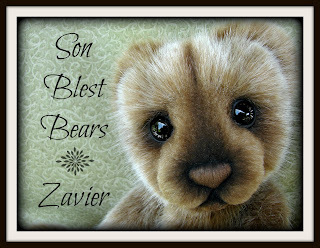 Thank you so much in advance!! 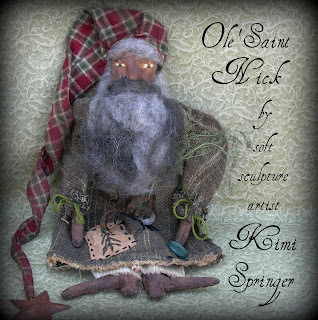 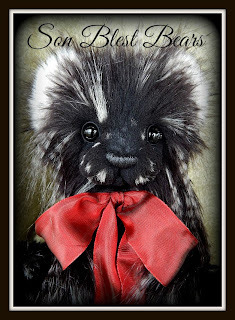 He was created using a silvery gray mohair. 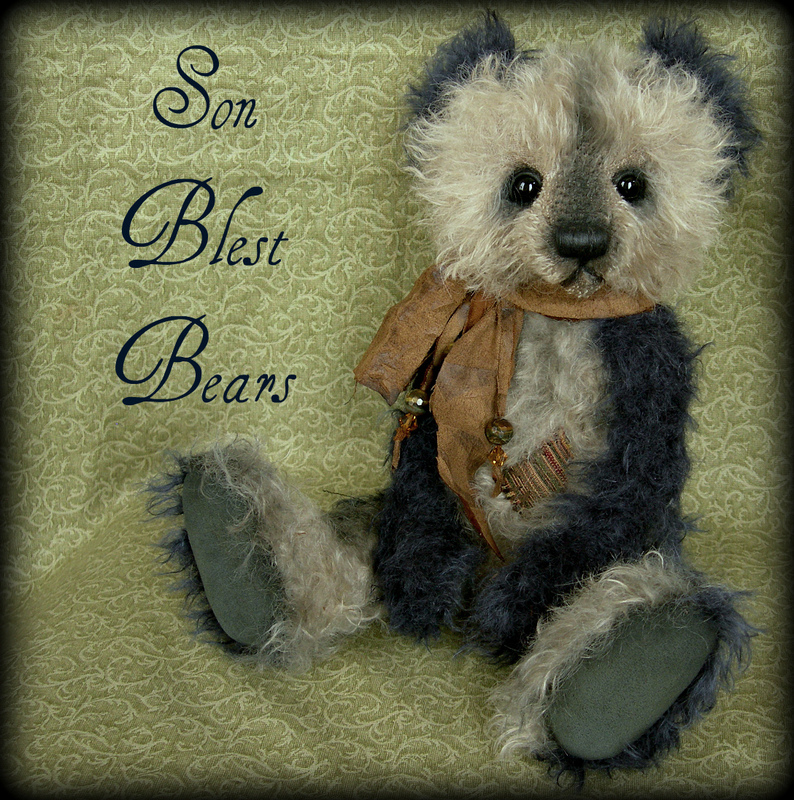 I hand-dyed the outside of his arms, legs and both sides of his ears in dark navy blue. I then antiqued him first using a cinnamon and coffee mixture. 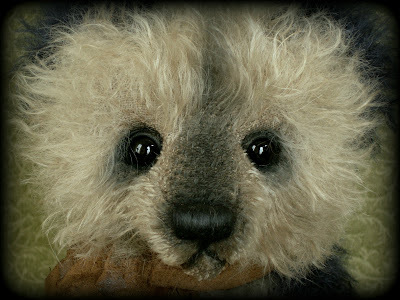 After drying, I used a combination of dark blue and brown oil paints to add additional shading and antiquing to give him a nice subtle vintage look. He has a little fabric patch handstitched on his belly to add to his vintage charm :) He has premium black glass eyes with upper eyelids with shading all around to give them nice depth. I handstitched his nose in very dark brown, then lightly waxed and shaded it in black for further dimension. 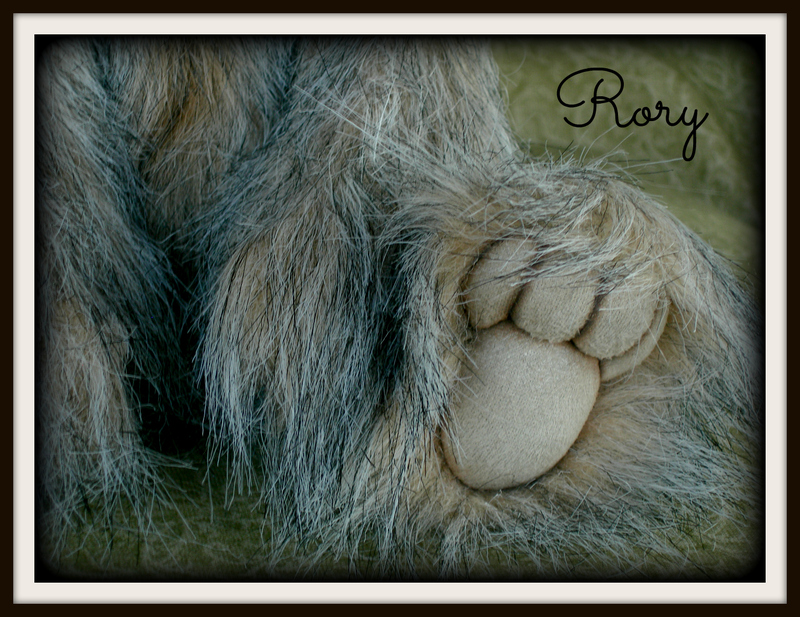 His paw pads are dark blue ultrasuede which are shaded lightly in a dark blue/brown mixture. I made him a fabric 'scarf' around his neck. 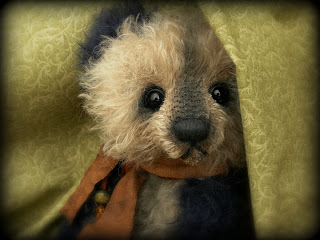 I actually made the scarf after putting it on him so I don't know what it would look like if you took it off..lol!! 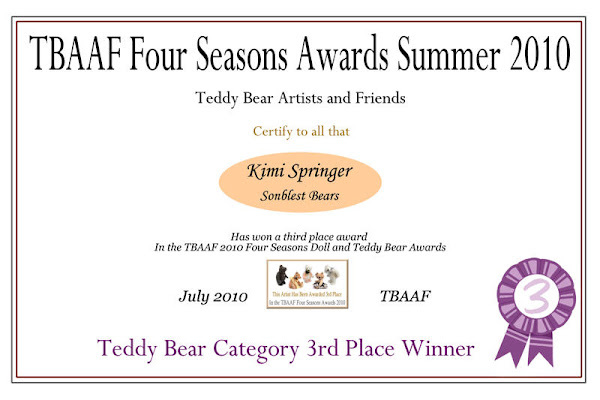 The scarf, not the bear! hee hee! I tied the rusty brown fabric 'scarf' around his neck, the cut some ribbon strips onto which I threaded brown & gold glass beads. 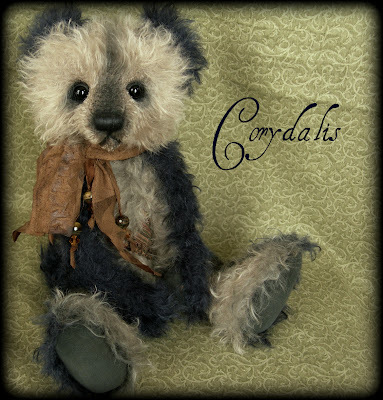 It was just the right touch because it fits him perfectly :) He is approximately 12 3/4" tall and sitting he is approximately 9". 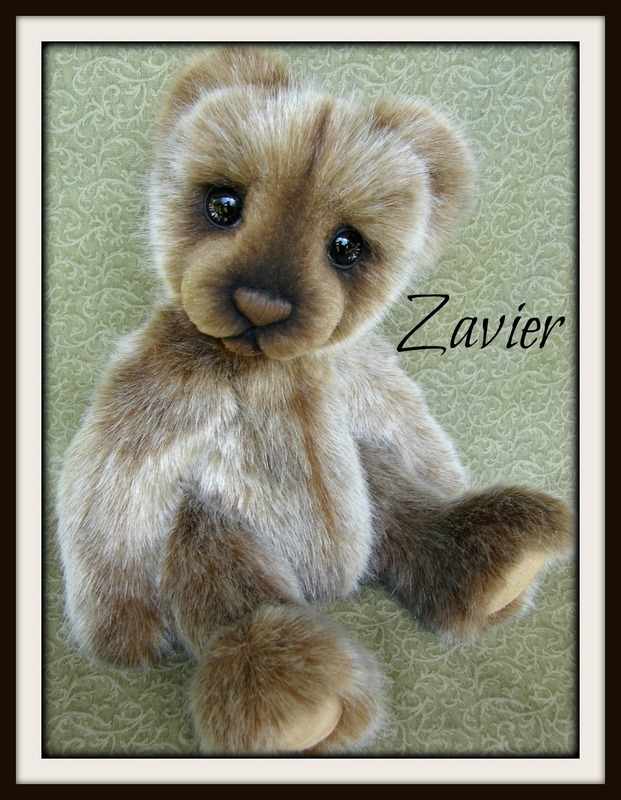 He's fully 5 way jointed and weighted a bit with steel shot sand in his belly. 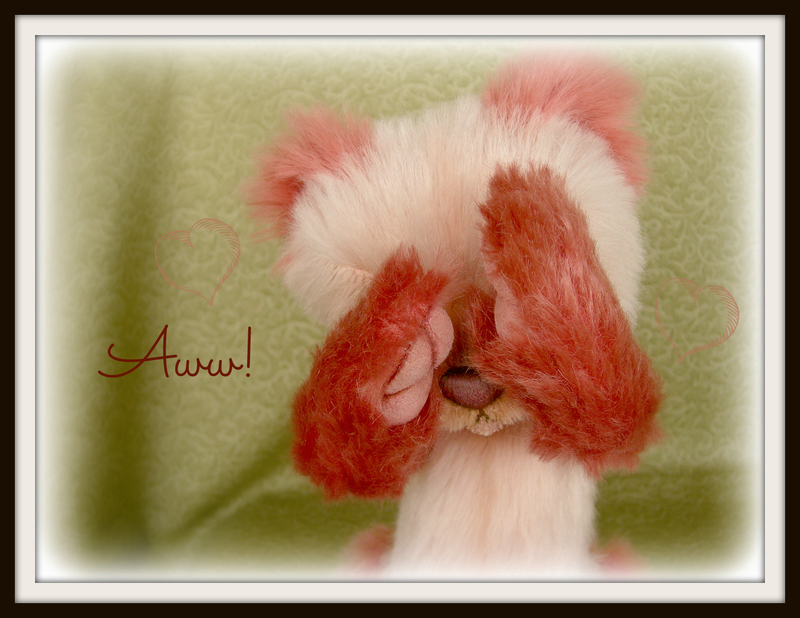 Always remember that color monitors pick up colors differently so he could look slightly different in person than what he looks like in his pictures. 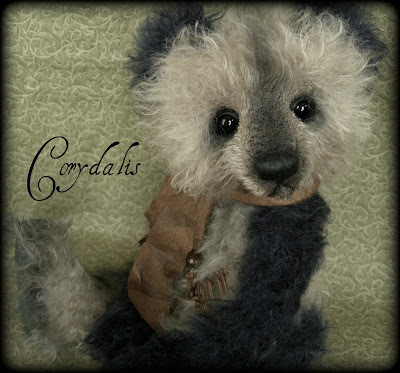 Corydalis is listed on ebay for 7 days with no reserve. 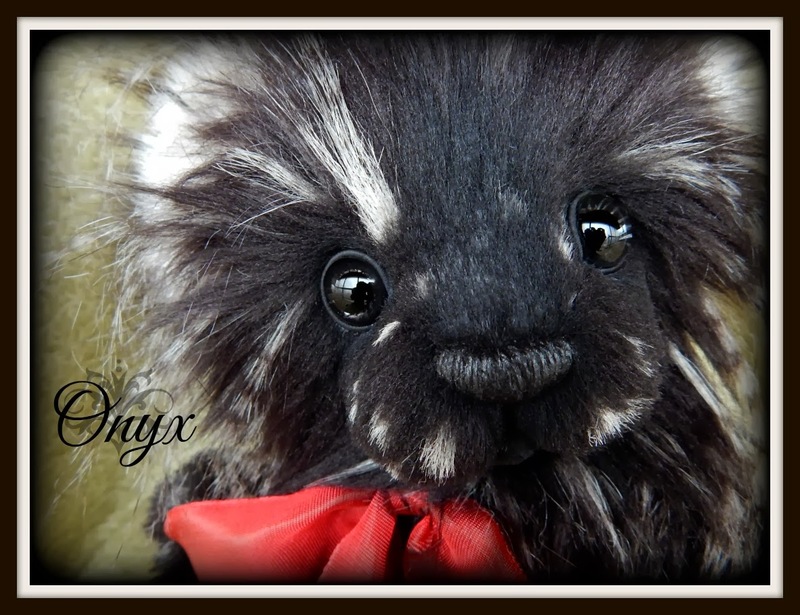 To view his auction please click on the link below :) His auction ends next Thursday, Febuary 9, 2012 at 9:00 p.m. EST. 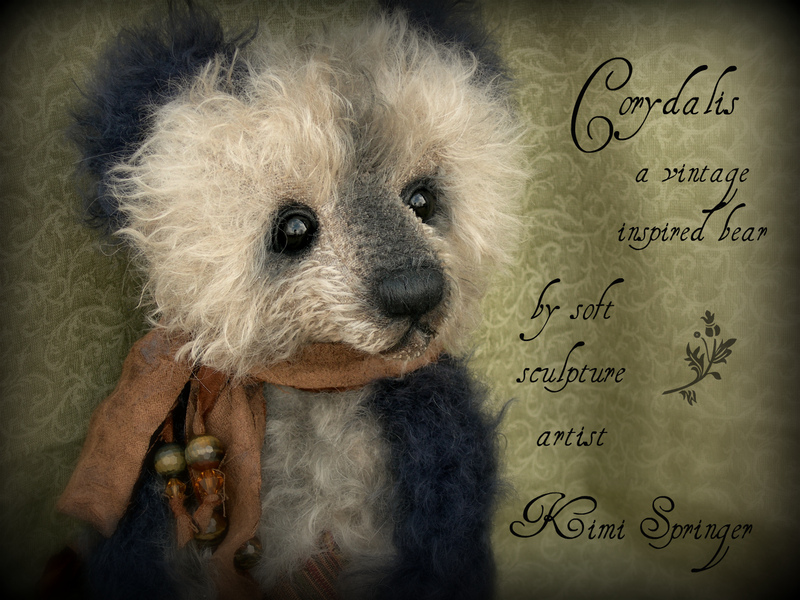 Thank you so much for considering and as always a huge Thank You for following my work especially as sporadic as it is most of the time! 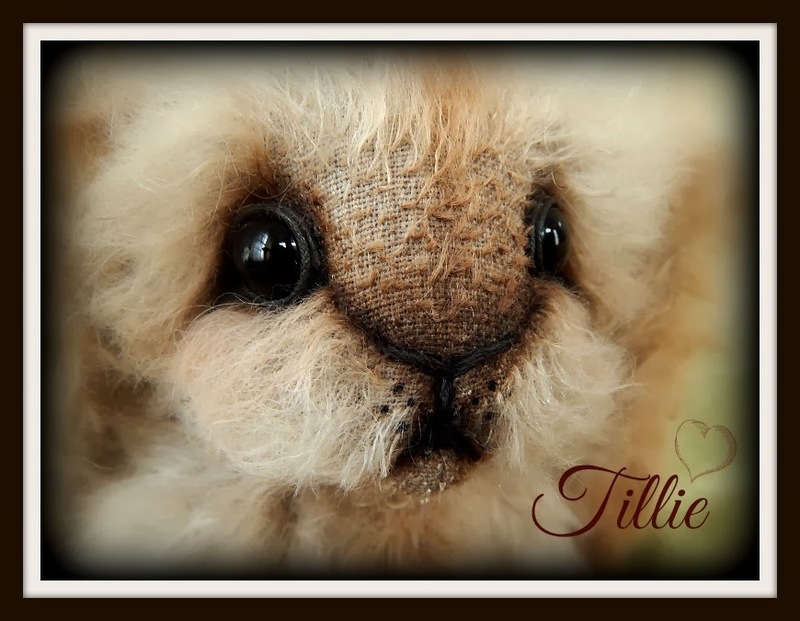 I appreciate your interest SO much, I could never say Thank You enough! A big Thank You for stopping by! I hope you have a wonderful day and come back soon! 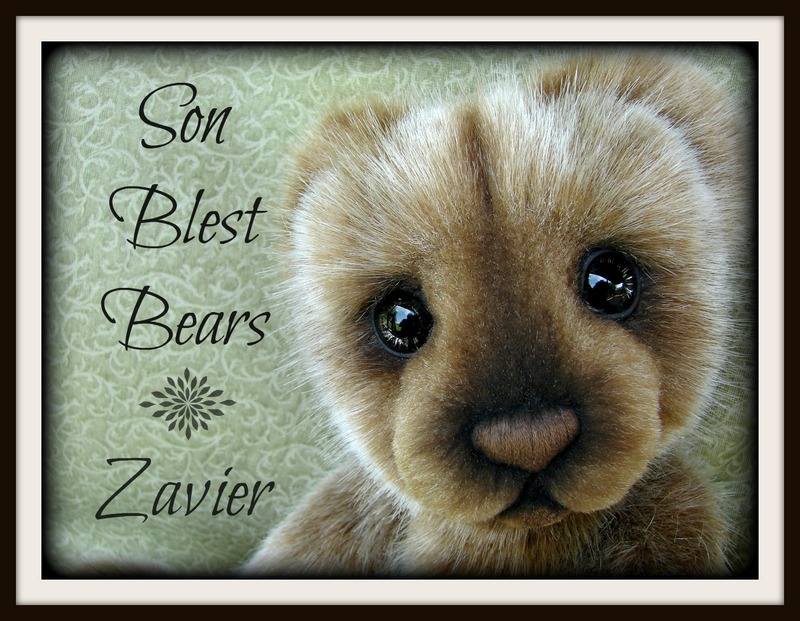 I am a full-time wife to the most wonderful husband, mom to two amazing kids & soft sculpture artist specializing in one of a kind teddy bears.